Barnsley suffered a second bout of travel sickness in the space of four days following a 3-1 defeat at Shrewsbury. Bidding to bounce back from Saturday’s loss at Charlton, the Reds paid the price for a poor first-half performance at New Meadow. They fell behind to goals from Greg Docherty and Ollie Norburn inside 23 minutes and lost key midfielder Kenny Dougall to injury. Ethan Pinnock gave Barnsley hope early in the second half, but Luke Waterfall added a third as Daniel Stendel’s side slipped to fifth in the table. The Reds, having welcomed fit-again top-scorer Kieffer Moore back into the starting line-up, were behind after just two minutes following an error from Adam Davies. The Wales goalkeeper parried Josh Emmanuel’s cross into the path of Docherty and the on-loan Rangers midfielder made no mistake from six yards. Dougall limped off as a result of a heavy challenge from Anthony Grant, who was booked, and was replaced by Cameron McGeehan. Two minutes later and Barnsley were 2-0 down, the goal arriving in unfortunate fashion. Norburn tried his luck from range and his shot deflected off Alex Mowatt and looped over Davies. Davies prevented his side from falling further behind, producing a brilliant stop to deny Fejiri Okenabirhie when clean through. Barnsley came out firing at the second half and Joel Coleman had to be alert to tip behind Mowatt’s shot. Coleman could do nothing about the visitors halving the deficit moments later, though, with Pinnock firing home from close range. Tempers flared on the touchline, leading to Stendel being sent to the stands following a scuffle. Barnsley, led by lively substitute Ryan Hedges, threw everything at the Shrews.Liam Lindsay almost made it 3-2 but his header from Mowatt’s cross cannoned back off the crossbar. Shrewsbury: Coleman, Emmanuel, Haynes (Laurent 65), Beckles, Docherty (Barnett 87), Angol, Okenabirhie, Bolton, Waterfall, Norburn, Grant. 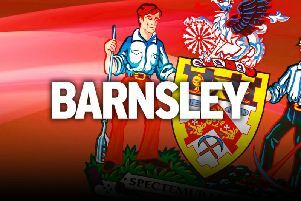 Barnsley: Davies, Dougall (McGeehan 21), Pinnock, Lindsay, Cavare, Moore, Potts (Moncur, 61), Bahre, Thiam (Hedges 73), Mowatt, Williams. Unused subs: Walton, Jackson, Williams, Brown.